So the sugar fast is holding for me, with the help of green tea, raspberries and pears. And I’m already feeling better for eating well. It reminded me that great food, good moods and exercise all go hand in hand. As soon as I made the decision to eat better, I remembered to take my supplements, like vitamins, probiotics and omega oils regularly and I suddenly had the urge to get strong again. So I’m starting with the booty. I’ve always had one but it disappeared after Isaac. Lots of sitting on it and not enough deadlifts mean my bottom has lost its former glory. In the past 24 hours I’ve seen three images that have inspired me to get squatting again. I’ll share them. Instead I will be doing lots of these. 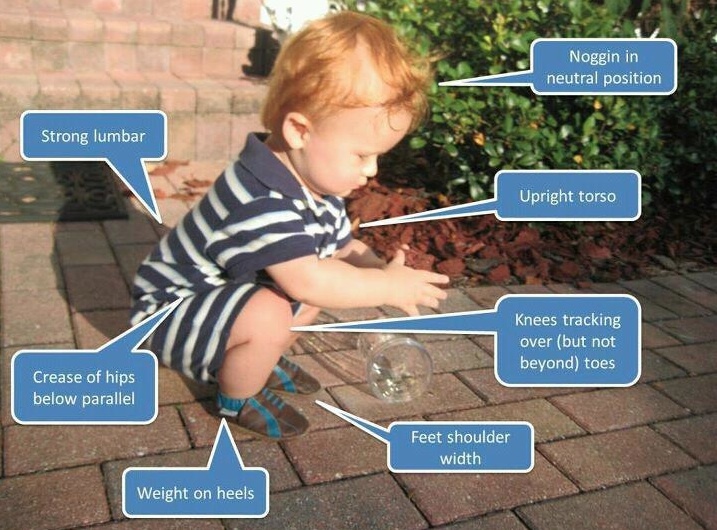 Babies know how to squat. They do it all the time and their technique is perfect. To be able to squat like a baby is still just about manageable but I cannot push back up again. My knees are in turmoil… But to have a booty like that… Yes, that is something to which I aspire.